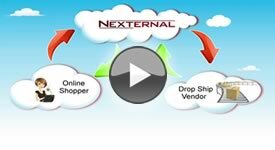 Through your Nexternal Order Management System, you can define a vendor as being a "drop-ship" vendor. When you have the drop-ship functionality activated, the drop-shipping company automatically receives an email notifying them of the products that need to be shipped along with the relevant shipping address. Drop-ship vendors can log in to a vendor specific Order Retrieval & Update System where they can mark line items as shipped and supply tracking numbers. The entered tracking information is then available to both the customer and retailer. Our shopping cart software uses email tracking codes so that retailers can see whether or not a drop-ship email has been viewed by the drop-ship vendor. Should there be a problem with the vendor's email, merchants can kick off an additional email to the drop-ship vendor with the appropriate line item and shipping information. All notification emails are logged with a date and time stamp made available for the retailers. There are a plethora of configuration options available to you so that your drop-ship program can run as you see fit. For example, you can determine what event triggers an email to the drop-ship vendor. Such events include when the order is placed, when its status is marked as paid, or when its status is marked as "in process." You can also opt to trigger all emails manually with the simple click of a button. You may also customize the text in the email that goes to the vendor. Using this module, you no longer need to manually notify your drop-ship vendors of orders they need processed. You also do not need to follow up with the drop-ship vendors because they can update the order statuses and print packing slips. The drop-ship module creates a win-win situation for both the merchant and drop-ship vendor. If you are interested in learning more about how your company can utilize our drop-ship module, please call 800-914-6161.